First Line:"Harper? Are you in here?" Review: I found myself enjoying Stupid Boy more then I thought I would. The book is the second in a series but can easily be read as a standalone, although I have not read the first one which is titled Stupid Girl and really wish I did read it before reading Stupid Boy since the two main characters from that book are around a lot in this one. Harper Belle and Kane McCarthy are total opposites on the surface. Harper is president of her sorority, wealthy and very prim and proper. As for Kane he is the bad boy, he is into illegal stuff and has a not so good reputation. Yet when we get below the surface of what these two portray to the world we see that they both are just putting on a mask of sorts. Harper and Kane both went through some extremely crappy stuff at a very young age that has scarred them pretty deep. Miles really does an excellent job getting us to understand Harper's psyche with all the flashbacks and the nightmares, I'm not going to lie to you it wasn't an easy read and not in a bad way but it really gets to you to know that all this stuff happened to Harper when she was so damn young. Same with Kane, Miles did a great job in showing us his past which helped me connect with him better as well. I liked the message Miles was sending with this book. Don't judge someone based off their outer appearances. A person may seem well put together but who knows what is going on underneath and then you have the "bad boy" Kane but we soon learn he had a really good reason behind it all and he was actually very far from the persona he portrayed to the world. So yep...never assume anything about anyone. 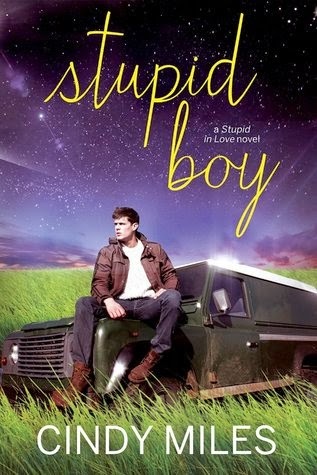 Overall I found Stupid Boy to be a highly enjoyable read and I'm actually looking forward to the next book and plan on reading the first book in the series soon. ~"No. You're more like a silent storm. You have a quiet sort of strength." ~"You'll know if your heart has been lost when you put his needs before yours. When you'll do anything to keep a smile on his face and pain out of his heart."